39:0.10 Human beings sometimes find it hard to understand that a created capacity for higher-level ministry does not necessarily imply ability to function on relatively lower service levels. Man begins life as a helpless infant; hence every mortal attainment must embrace all experiential prerequisites; seraphim have no such preadult life—no childhood. They are, however, experiential creatures, and by experience and through additional education they can augment their divine and inherent endowment of ability by the experiential acquirement of functional skill in one or more of the seraphic services. 39:2.13 The angels cannot transport combustion bodies—flesh and blood—such as you now have, but they can transport all others, from the lowest morontia to the higher spirit forms. They do not function in the event of natural death. When you finish your earthly career, your body remains on this planet. Your Thought Adjuster proceeds to the bosom of the Father, and these angels are not directly concerned in your subsequent personality reassembly on the identification mansion world. There your new body is a morontia form, one that can enseraphim. You “sow a mortal body” in the grave; you “reap a morontia form” on the mansion worlds. 39:2.15 Broadcasters—receivers and dispatchers—are a specialized subdivision of the seraphic recorders, being concerned with the dispatch of records and with the dissemination of essential information. Their work is of a high order, being so multicircuited that 144,000 messages can simultaneously traverse the same lines of energy. 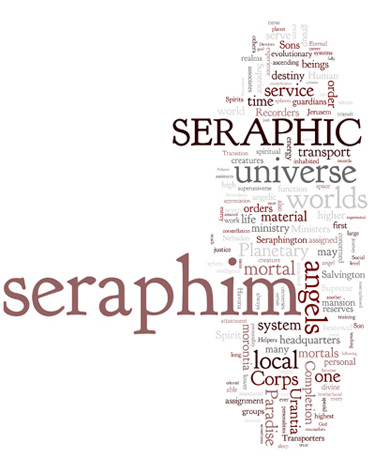 They adapt the higher ideographic techniques of the superaphic chief recorders and with these common symbols maintain reciprocal contact with both the intelligence co-ordinators of the tertiary supernaphim and the glorified intelligence co-ordinators of the Seraphic Corps of Completion. 39:5.7 4. The Spirits of Trust. Suspicion is the inherent reaction of primitive men; the survival struggles of the early ages do not naturally breed trust. Trust is a new human acquisition brought about by the ministry of these planetary seraphim of the Adamic regime. It is their mission to inculcate trust into the minds of evolving men. The Gods are very trustful; the Universal Father is willing freely to trust himself—the Adjuster—to man’s association.